This article on Gamasutra explains the distinction to approaches to RPG design: Deterministic and Abstract. An RPG can use a combination of these two different approaches to achieve a unique 'feel' for the game. An abstract approach is more based around more arbitrary gameplay systems which are balanced first and given context and form later. They are essentially more driven on things like hit points and magic values. Games like Final Fantasy and World Of Warcraft tend to use this approach where each monster is just a collection of hit points with weaknesses and strengths to certain elements. Gameplay elements are added in for the sake of improving and balancing the game rather than trying to copy reality. A deterministic approach is when the gameplay mechanics used are part of the fiction of the world. This is used in traditional RPGs where creatures like trolls would have huge strength values that are out of proportion to everything else adding depth to the game world by showing how tough the trolls actually are, the imbalance in the gameplay creates a narrative and adds to the story. This allows for more freedom in terms of world building but makes it a lot harder to balance the game, especially if the game mentioned has a multiplayer mode. A combination of these would have to be mastered for creating a unique and engaging RPG. The gameplay would have to be balanced and cohesive while still having a sense of place in the world. Some modern RPGs have started to do this well like Skyrim but there is still a lot that can be done to tangle these two systems together and create a more immersive game. This is a game that I have come across a few times in my research into games. Released for the SNES in America in 1995 it became a cult classic for it's parody of american culture and of the RPG genre. 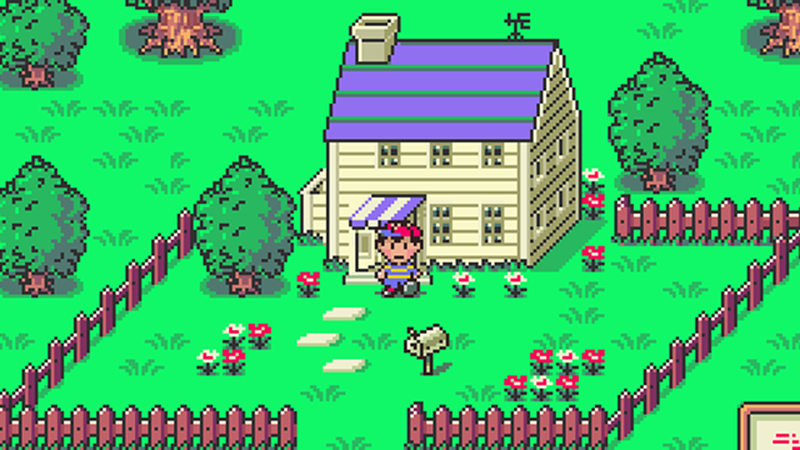 It was unique at the time for being an RPG set in a modern world setting and for having no overworld map and being entirely seamless. It also doesn't have random battles like other RPGs at the time and its predecessor. The feature I like about it in particular though is the fact that it has a rolling hit point counter which means if the enemy deals a devastating blow to your character then you have a little time before the hp counts down to zero to either heal or make a last ditch attack which adds a little bit of panic and urgency to battles.